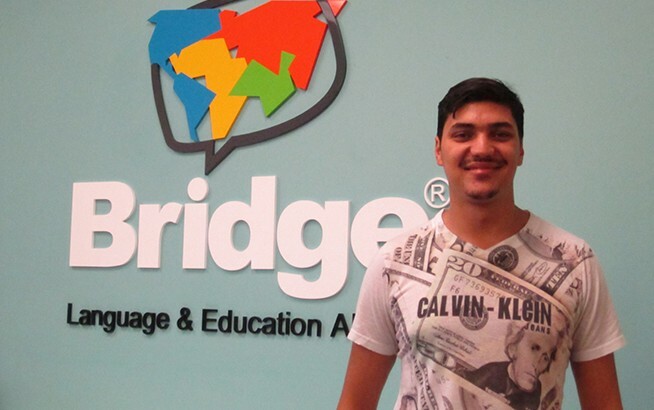 Gabriel is a Brazilian student who is currently studying at BridgeEnglish, Denver. In Brazil, he works as a manager of a bank and of a pizzeria. When he returns home, he will put his new English skills to use and help with translating at the bank. He has greatly enjoyed his time studying English at Bridge and exploring Denver! We asked Gabriel to tell us a bit more about himself and his experience here in the U.S. I am interested in studying English Grammar. Brazil, it’s a warm country and a great place to live. I live in Sao Paulo. I love the food and Carnival. The people are very friendly and are happy in Brazil. Carnival is an event you must see when traveling to Brazil!!!! It is different than other countries when learning English. Learning the English/American accent is interesting here in Denver. I find the American accent difficult to grasp, but a good challenge. My Brazilian teacher, Vaness Munaro introduced me to Bridge and the general program and lessons here. The U.S traditions are interesting and the people are so friendly here in Denver. The food is good especially the French fries and hamburgers! I love the variety of food in the U.S. I miss Brazilian food, and the sunshine and beaches. The most difficult part was grasping the American accent and understanding the pronunciation when I first came to Denver. It was very difficult to understand Americans, because in Brazil I was learning different pronunciations and words. The teaching style here in America is harder, but better overall. Going out and meeting other friends! I like to go to bars with Bridge Students. I also love American sports such as Baseball, Football, and Soccer! I love the activities that Bridge puts on and I have enjoyed participating in them. Before I came to the U.S., I thought Halloween wouldn’t be important or even celebrated. Then I saw all of the parties and was surprised. I plan to keep studying English and to start translating in my current role as a Bank Manager. I want to take Business English courses later to improve my English in a corporate setting. Later in life, I would like to get married and start my own business/company and have a successful career. Go to the USA please! I think that the pronunciation is better here and you can learn English grammar because the teachers are wonderful here at Bridge. Interested in studying English in Denver? Get started by learning more about our General English Program.